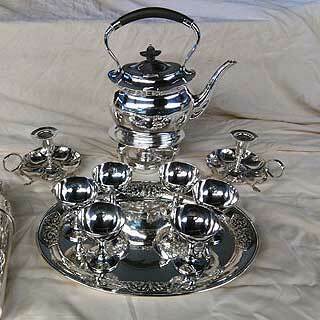 Due to the decline of industry in America and the onset of the modern throw away society there are few journeymen left nowadays providing such a refurbishing service to homemakers, decorators and others wanting to restore classic heirloom treasures including silver and silver plated items. 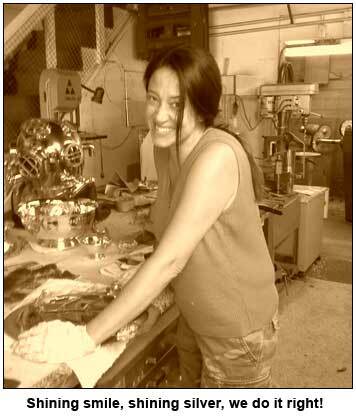 Here you see Cheri, our silver polishing Maven and Queen of Sparkle working on an antique tea and coffee set, an elaborate engraved tray with coffee and tea pots, creamer and sugar bowl. 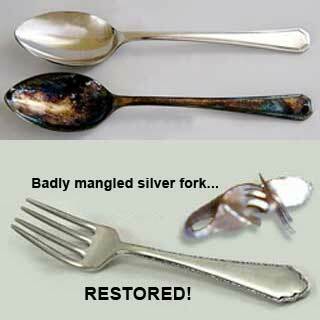 It takes knowledge of special techniques and products to restore tarnished or damaged silver and as ever was it takes patience and time. Cheri's talent was passed down to her by her grandfather who was the head butler of Partridge Hall, one of the few surviving stately homes of England. This is complete nonsense of course but it does sound grand and illustrates the antiquity of the art. 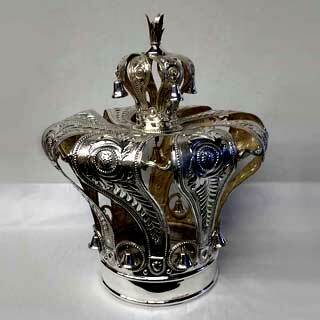 While we can make repairs and re-silver small areas of damage at our shop, when complex repairs and complete replating is required, we consult with long established silversmiths to ensure your treasure is properly restored. So, before you damage or make a mess with toxic products that may do more harm than good, please consider engaging Santa Cruz Metal Polishing and thus present your splendid silverware at your table with pride, by having us revitalize it's grand appearance and fabulous sparkle.